Ever wanted to just pull out your very own Identification Card, yet.. it's a furry identification card? This is not a badge, it's an Identification Card. Tons of customization options including color + card pattern! Place either Location up top or default ( Fursonal ID™ ). Custom signatures to pick from for name. Photos will always be on left side for this version. Customize ID information located on front of ID. "Fursonal ID™" will be displayed up top instead of location. Choose color of "Fursonal ID" title and photo background. Flat colored artwork image done by artists. 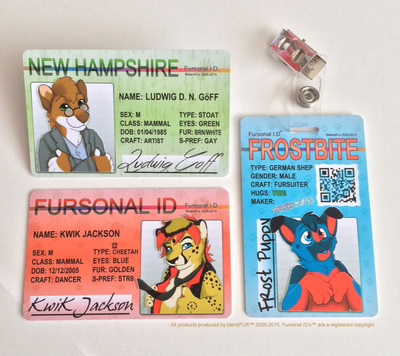 Badge Version of our Fursonal ID™ cards! Universal in design, wear at any convention! ID number for re-ordering in case lost or damaged! Choice of "Fursuit Maker" OR creation date. Custom signatures to pick from for name!